What Happens When We Don’t Like the Science? Recently I’ve seen some criticism relating to Dr. Temple Grandin from a few people who are opposed to her ideas on animal welfare – namely that we need to listen to the consumer and understand what they think and want. It doesn’t seem like rocket science, does it? Ignore your consumers wishes and pretty soon you don’t have a market. “Just show consumers the science, not the emotion…” seems to be the battlecry. “If somebody hasn’t published a peer-reviewed paper on it, they shouldn’t be allowed to say it!” Except it’s not as simple as that, is it? Just look at the furore over LFTB (lean finely-textured beef or so-called “pink slime”). A safe, technologically-sound, scientifically-approved product that, once it was labeled pink slime, was utterly undesirable to the consumer. Never mind that they were still happy to eat Twinkies, Slim-fast (just what is that pink powder?) or kelp juice (green slime? ), the perception was out there that LFTB was gross, and no matter how much science was quoted, bang, out of beef products it went. We can talk about science all we like, but sometimes that just isn’t going to get the message across. I can’t imagine that any consumer who goes into a battery chicken (caged layer) house or sees a photo of a pig in a gestation crate says “Wow, what a beautifully efficient and scientific system!” That response becomes even less likely when all they see is a photo of it on Facebook. So what happens when the science doesn’t play nicely into our perceptions and beliefs? When about social science papers that show that consumers evaluate foods based on emotion, not science? Or survey data that shows that we can take consumers to a farm and explain agriculture…but that it doesn’t change the preconceived ideas that 75% of them already held? * Do we ignore the inconvenient science because we don’t like the answers? Keep banging the same drum and hope that we can maintain the status quo? Here’s a thought. Rather than looking at agriculture through your own eyes, try and see it through the eyes of somebody else. Part of Dr. Grandin’s success can be attributed to that fact that, because of her autism, she can empathize with animals in handling systems. Isn’t time we followed her example and tried to think outside the cattle chute? I love conversations that leave my brain firing on a million cylinders and open my mind to new ideas. 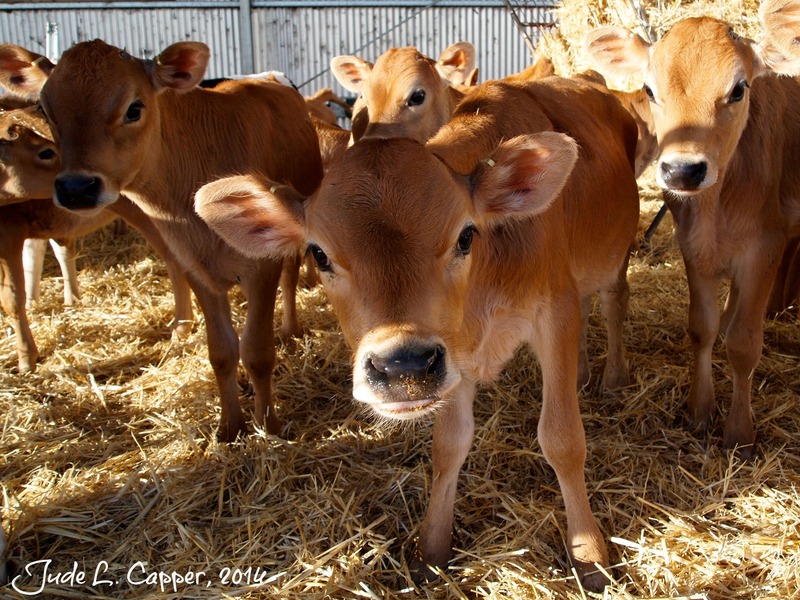 I was lucky enough to have three such discussions this past week, one at an organic research farm; another at a 300-cow Jersey operation; and the most recent with three faculty at the University of Oxford with regards to the interactions between animal welfare and livestock sustainability. Animal welfare is a touchy subject – many people appear to define excellent welfare as only including a narrow range of production systems or practices; and although everybody has their own image of what a “happy” animal looks like, it’s not always easy to identify or describe those systems without anthropomorphizing. Indeed, I’ve become increasingly aware that promoting improved productivity and efficiency as a means to improve sustainability can be misconstrued as encouraging the agricultural equivalent of a owning a Victorian dancing bear or cymbal-playing monkey – a “force the animals to perform, regardless of the cost in terms of animal welfare”-type philosophy (see picture below). Yet such suggestions entirely miss the point, as any system that is consistently detrimental to animal welfare is neither productive nor efficient on a long-term basis. We humans don’t perform well if we’re chronically underfed, stressed, sick, or housed in unfavorable environmental conditions – and neither do livestock. Personally, my agricultural utopia would be one where all livestock operations, regardless of size, location or production system, exhibit both high productivity and excellent animal welfare. Admittedly, this leads to the difficult task of not only defining excellent welfare, but also the metrics and benchmarks by which it can be assessed within each operation. However, there is one overarching metric that can be measured, and improved on any farm or ranch – animal health. By definition, an animal that is chronically sick, lame or in pain cannot be said to be a example of good welfare. As consumers, we want to know that the animals that provide us with milk, meat and eggs are healthy. Indeed, I imagine that even the most militant vegan opposed to the consumption of animal products would agree that animal health should be paramount. As producers, making sure that livestock are healthy is as ethically important as treating workers well. Plus, healthy animals are easier to manage: they grow faster; they have fewer incidents of illness or death; and they produce more milk, meat or eggs. These improvements in efficiency and productivity also mean that we need less feed, less land, less water and have a lower carbon footprint per unit of food produced. Let’s consider lameness in dairy cattle. A major animal welfare issue, it costs between $120 and $216 per incidence (UK costs below)* and is a major cause of cows being culled at or even before the end of their second lactation. Similarly, mastitis has a huge impact on both cow longevity and productivity, and costs the US dairy industry $1.7-2.0 billion per year. If just these two health issues were addressed, how many associated dairy cattle health and welfare issues would be improved; how much could dairy farm profitability be enhanced; and how much would the public image of dairy improve? Every herd has its best cow – the one who is never lame, doesn’t suffer from mastitis, metritis or ketosis; and gets back in calf easily – all while having a high milk (and components) yield. There is no magic bullet to improve productivity and efficiency – yet the discussions I’ve had in the past week conclusively demonstrated that that does mean suiting your system to your available resources and, though excellent health, nutrition, breeding and management, allowing every cow to perform like your best cow, every single day. I wish you a Merry Christmas and hope that in 2015, all your cows will be like your best cow. *Lameness costs £180 pounds per incidence in the UK, or £15,000 per average herd annually. Mastitis costs the UK dairy industry £170 million per year. 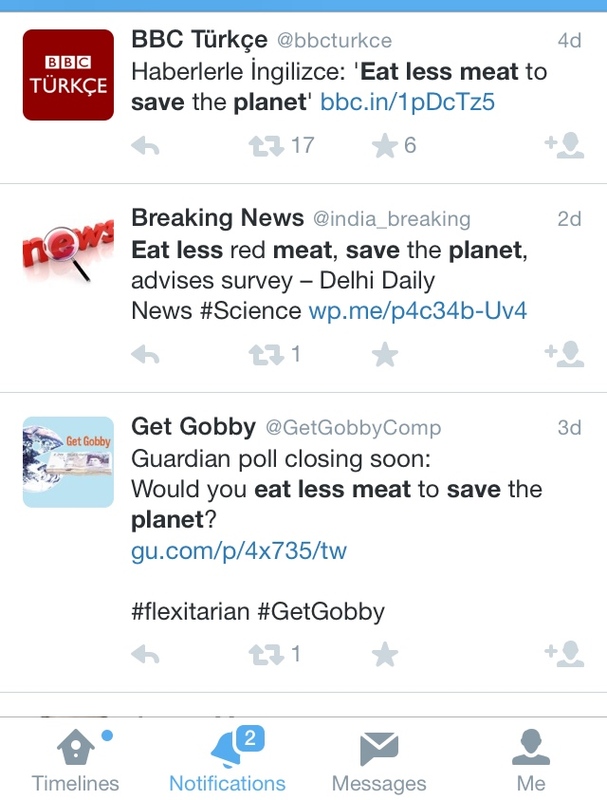 The suggestion that we should eat less meat in order to save the planet pops up with monotonous regularity in my twitter feed. Interestingly, those who make this claim are almost always vegetarian, vegan or profess to eat very little meat. This is rather like me asserting that we could mitigate climate change and save resources by eating fewer bananas and curbing our windsurfing habits. I loathe bananas, and if you ever see me windsurfing you’d better be sure that there’s a nearby hospital bed and neck brace with my name on it. As you can imagine, giving up either activity would have little impact on my life. This is why I find it interesting and rather facile that those who do not eat meat proclaim fleshy abstinence as the way forwards. It’s easy to preach a solution that has no impact on your life – far harder to make a dietary or lifestyle change that actually impacts you. The “eat less meat” movement would have far more credibility if it was promoted by a hunting, fishing, grilling, hamburger-lover who publicly declared his/her love for meat in all it’s many forms, and bemoaned the fact that they felt they should forgo the steak in favor of the tofu stir-fry. Yet this doesn’t happen. Why? Because the vast majority of us simply don’t feel that an intangible threat (we can’t see or feel climate change, or conceptualize the quantity of oil reserves remaining) is sufficient to make us give up our carnitas burrito. In reality, meat eating is only likely to decline if it becomes too expensive or subject to regulatory sanctions (e.g. rationing similar to that in Britain during WWII). The influx of papers suggesting that we should reduce consumption therefore fall on deaf ears. So let’s face the facts. Neither the national or global population is likely to reduce meat consumption in the near future, and the rising income per capita in India and China will increase demand for meat still further. Instead of making recommendations based on notional utopias, let’s focus on areas where we can really improve. Amazing gains in productivity have allowed the beef, dairy, pork and egg industry to considerably reduce resource use and greenhouse gas emissions over the last century. With a culture of continuous improvement and access to technologies that improve productivity, we can feed the future population using even fewer resources. Let’s make better use of the multifarious by-products from the human food and fiber industry. Ruminants are blessed with the ability to digest fibers and plant materials that we either can’t or won’t eat – using by-product feeds to replace corn and soy refutes the claim that livestock compete with humans for food. Finally, take a look at your own plate. Globally, 33% of food is wasted. Just think of the reductions in resource use we could achieve (and people we could feed) if all the crops planted, fruit picked, and milk, meat and eggs produced were consumed, rather than just 2/3 of them. We evoke change by leading by example – I’m off to enjoy a steak, conventionally-raised using 12% less water, 19% less feed and 33% less land than its equivalent in 1977. You’d better believe that if there’s any left, it’s going in a sandwich tomorrow. As my Grandma used to say: Waste not, want not.